This allergy free fruit buckle can be made with the fruit of your choice and is dairy free, egg free, soy free, wheat/gluten free, peanut free, tree nut free, fish free, and shellfish free. It’s a delicious dessert that is quick and easy to make. 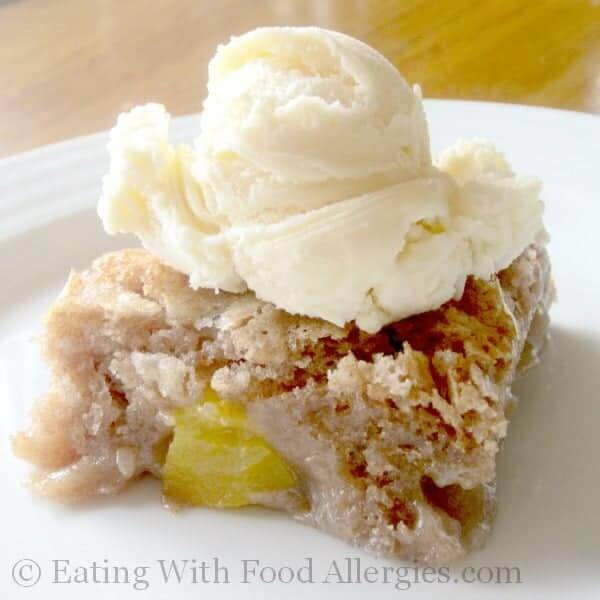 When I originally made this allergy free fruit buckle, I called it a cobbler. I’m not sure why because it really isn’t a cobbler at all! After coming across a very informative article on the differences between cobblers, crumbles, grunts and buckles, I realized that this really is more of a buckle. Or maybe it’s just a cake with fruit in it. Either way, it is a dessert that is as easy to make as it is versatile. This “buckle” is delicious with fresh picked berries but, if you aren’t able to get fresh fruit, you can used frozen or even canned fruit. One of our favorite versions of this recipe is peach buckle using a large can of peach slices. Just be sure to drain the juice before dropping them in the batter. 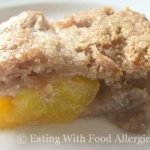 When made this way, it tastes a lot like peach pie and is especially good with a scoop of your favorite “safe” ice cream. Mmmmm! Whether it’s a cake, cobbler, crisp or buckle it’s a super easy dessert to make that tastes great! Enjoy it with a scoop of allergy free ice cream (get the recipe here)! This fruit buckle recipe is dairy free, egg free, soy free, wheat/gluten free, peanut free, tree nut free, fish free, and shellfish free. Preheat oven to 350 degrees F. Place margarine in 9x13 inch pan and set in oven to melt; when margarine is melted, remove from oven. In a mixing bowl, combine the flour, xanthan gum, 1-1/2 cups sugar, baking powder and salt. Add the vinegar and milk and mix until batter is smooth. Pour batter into the pan, then scatter the fruit evenly over the top. Sprinkle 2 tablespoons of sugar over the top. Bake in preheated oven until cake is browned and fruit is bubbly, 50-60 minutes. Serve warm with a dollop of allergy free ice cream.